Have you ever tried trimming a palm tree? It’s a challenging job! If you have palm trees here in the Las Vegas area, you know what we’re talking about. Palms produce a single leaf at a time, and once a full crown of leaves is achieved in a mature tree, an old leaf dies every time a new one grows. Yellow, brown, and broken fronds need to be trimmed off. Additional Palm Tree Service You May Need. Remove the flower and fruit stalks. When fruit and seed is formed, it takes away strength from the palm tree. When ripe, rodent pests and birds like to eat their fruit. Other palms, like Date Palm Trees, produce infertile fruit that later drops, which makes an enormous mess on your lawn, driveway, or sidewalk. Fan Palm Trees also have fruit which germinates in undesirable areas of your landscape. Clumping palms need to be thinned out or have their new growth pruned off if their size exceeds the space in which they grow. 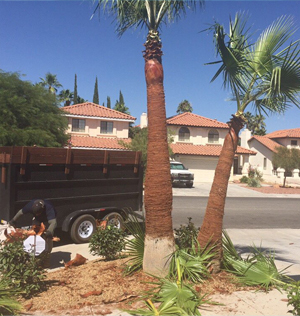 The Las Vegas and Henderson area has multiple palm tree specials which all require careful attention and maintenance. Bucket trucks can be used in certain locations, while climbers may scale a tree in locations where trucks don’t fit.